When you glide across your kitchen floor in the puddle of water your dog just left for you, it can be frustrating, not to mention dangerous. Switching or elevating the bowl can stop your pooch from turning it over. Pack your patience as this exercise may require trial-and-error with different dishes, but with persistence you should be able to nix the habit. 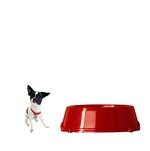 Large water bowl next to dog food bowl. Maybe his reflection in the water frightens him or he just likes to play. Swap his water bowl for one made of a different material. If it's a shiny stainless-steel dish, opt for ceramic or plastic. Or if it's a deep bowl, a shallower one might be easier for him to drink from, minimizing his need to tip it. Select a wide-based bowl with nonskid rubber pads on the bottom so he'll have more difficulty flipping it or pushing it around. Select an elevated feeder that keeps food and water bowls up. If you have a large-breed or deep-chested canine, such as a Great Dane or English bulldog, elevated feeders aren't always the best option. For these breeds, elevated dishes may increase the risk of bloat, causing an abnormally enlarged stomach. Part of the problem might be that his water is too warm. Pouring it on the floor before lapping it up makes it cooler. Add some ice cubes or chilled water to his dish. If this behavior continues to be a problem, buy an electric watering bowl. Most pups prefer flowing water.